Before we begin…I don’t typically read reviews from others until I have finished mine as I don’t want to be influenced by their thoughts. I was getting a bit confused in the beginning of the story though and so I’m glad that I stopped over at Goodreads and read the first review that popped up. The review was written by David Bergsland. Without it I wouldn’t have known that there is a free prequel, By Divine Right, which is intrinsic to the understanding of the story. Go grab it before you read The Shock of Night and it may save you some of the confusion that I experienced. I also recommend that you read Bergsland’s review as it is excellent. I absolutely love this book and I am absolutely frustrated by it at the same time. Let's start with the positives and then with my cautions for believers. Patrick Carr is a fantastic story crafter. I was captivated by The Shock of Night from beginning to end; it was tough to pull myself away and get back to real life. The ending truly was a mystery to me. Better minds than mine may have figured it out but it kept me wondering until the end. There is a feeling of Sherlock Holmes. Our protagonist, Reeve Willet Dura has crafted his gift of observation over the years and he is able to discern more than the average investigator as to what the crime scene and body have to say about the murderer. I enjoyed the intricacy and brilliance of it. Carr creates well-developed worlds and well-developed characters. As with any genuine relationship it takes time to determine someone’s character and in that manner we get to know our main character. Willet finds himself having to work with people who completely mistrust him; a feeling which is mutually shared. What is discovered over time is that Willet engenders loyalty. He is honest, brilliant, kind, and devoted to the poor. He is also intensely loyal. An eclectic cast of characters surround Willet that challenge, improve, and assist him in numerous ways. If you have read many of my reviews you will see that I almost always fall in love with a character; usually a minor character. My favorite in The Shock of Night is Custos the librarian. Oh to know a mind like that in such a humble man with such a kind soul. Don't worry...The evil characters are devilishly evil. They won’t disappoint as foils for our good Reeve. The Shock of Night is published under the genre Christian fiction by Bethany House Publishers. Unfortunately, the term “Christian fiction” in today’s market is far too flexible. Even within this flexibility, The Shock of Night is pushing credulity to me. Patrick Carr presents us with four religious factions. Carr calls it the four-part church. You will find representatives, called criers, of the four distinct orders in the town square proselytizing on behalf of their particular sect daily. They have a set schedule and a set location that is within hearing distance of one another from which they speak. The factions do not make a complete whole and they are set upon disagreement. No single faction stands out as the Christian church. There exists a complete dichotomy between this pseudo-religion and the Christian church, which worships and serves the triune God. The one true God that is one yet also three; the Father, the Son, and the Holy Spirit. The three parts of the trinity are not divided. They do not compete. They are one and the same. In contrast, Carr’s four-part church smacks of the religious dissension evident in the multitude of cultural religions rife throughout society. Carr does introduce a semblance of the trinity but it is not at all fleshed out and is mentioned only briefly. Throughout the book, I was confused as to Carr’s intentions with this religious structure. I never understood clearly how the parts fit together; it is like a puzzle with several key pieces missing. The closest modern-day religion that Carr’s pseudo-religion could be based upon is Catholicism as its structure contains bishops, cathedrals, unmarried priests, etc. but it still doesn’t fit. What is evident is that in no way shape or form is it Christian. The Absold’s crier—they were almost always attractive blue-clad women—had the largest portion of the crowd. Many of the men gazed at her with something other than religious fervor. As is discernible from the quotes above, many of the religious leaders are female. If you are unsure why I find this a concern, please read this article from CARM that can explain it far better than I could. In a nutshell... God's authority structure does not provide for women leading men. If this book were not placed within the Christian fiction genre I would not take such issue with it. It is when fallacy, in it’s filthy ugly rags, purports itself as the pure and holy truth that our combined hackles should be raised. Or should we enjoy the story as a whole, being aware that it contains biblical error but also knowing that it is enjoyable and clean? I want to say yes but must say NO. Do we need to major in the minors? YES, but then these points are not minor; Biblical inerrancy is not a minor detail. Anything presenting itself as Christian must be held up to the light of scripture. There is one spiritual component presented that I can agree with and that is that the Darkwater are representative of our lives. Once we choose darkness it comes snarling out violently. Only the rare person can block those desires returning to Christ. 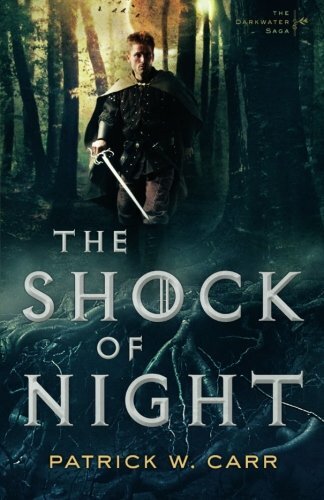 The Shock of Night is such an engaging fantasy. I wish that I could give this review without reservation.